Gregory Schlaff, founder of the Race for Safety campaign, is a former Marine, a martial arts instructor and a Baja 1000 racer. You know, your typical Taoseño. Well, maybe not so much. I don’t personally know of any other Baja racers in our small town. For those unfamiliar, the Baja 1000 is one of the last places where men and women still test endurance, mechanical and driving skill matched with sheer will against the brutal landscape of southern Mexico. Begun in 1957, this November’s race marks the 50th anniversary of the event. Gregory Schlaff is out to win it. Not for any ego gratification, but to raise awareness for his campaign, Race For Safety. The idea is simple—equip and train desert racers for extreme emergencies. The idea is the result of a tragedy last year in which the driver of the vehicle Schlaff was co-driving was unexpectedly struck by another racer, resulting in the death of 48-year-old Mark Luhtala. As a Marine medic, Schlaff was no stranger to trauma, but was surprised to find he lacked the necessary items on hand to adequately treat his friend and teammate. In describing the accident, Gregory’s voice remains even as he speaks about his initial thoughts that they had experienced a tire blowout or some other mechanical failure. The accident took place on a short section of paved main road, an anomaly in the race that had detoured to avoid a washed out impassable area. “As soon as I looked over and saw that Mark was unconscious, I went around the vehicle to check him. The cage, the paneling, the exhaust was all pushed in on him and I had to pull it off of him, at which time I saw his left leg was practically severed.” It was at this point that Schlaff realized he had no trauma kit with which to treat his friend. Utilizing a belt from a bystander, he fashioned a tourniquet, after confirming a pulse, and stopped the bleeding. In Mexico, as in rural areas in the States, help can be hours away. The reality of cartel activity keeps helicopters from flying at night, thereby costing a precious and timely resource. This would prove to be a factor in Mark Luhtala’s death. Schlaff is clear about not placing blame in the accident. The facts of Baja racing are plain enough—three fatalities in the previous year’s race, and an average of a death a race in the years leading up to it. This is not a sport without its risks and to be certain, the risks are part of the draw. As someone once put it to me, “Of course riding a motorcycle is dangerous. That’s what makes it cool.” There’s a fine line between calculated risk and simple preparedness however, and this is the gap Schlaff hopes to fill. Basing his R-FAKs (racer first aid kits) on the military I-FAK (individual first aid kit) the R-FAK is specifically designed for desert racing. 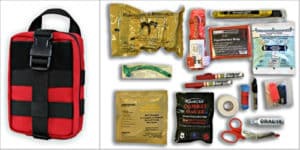 Knowing that a kit without the knowledge to use it is all but useless, Schlaff has also assembled a team comprised of trained and combat experienced medics drafting training materials and programs to accompany the kits. It isn’t until he starts talking about Mark Luhtala the person, that Schlaff’s voice starts to waver and he asks me, “ Do you mind holding on just a minute?” Regaining his composure he speaks about a man that was more than a desert racer. “We were all just kind of shocked at the memorial, at all the people who kept coming up and they’d say, Mark paid our mortgage for a year. 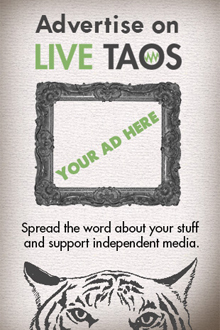 Or, Mark helped us get our business off the ground. It was around this time that I remember thinking, this can’t just be a loss. We’ve gotta make this count.” Hence the Mark Luhtala Baja 1000. To outfit a Baja race team is a big job and it takes lots of dollars. 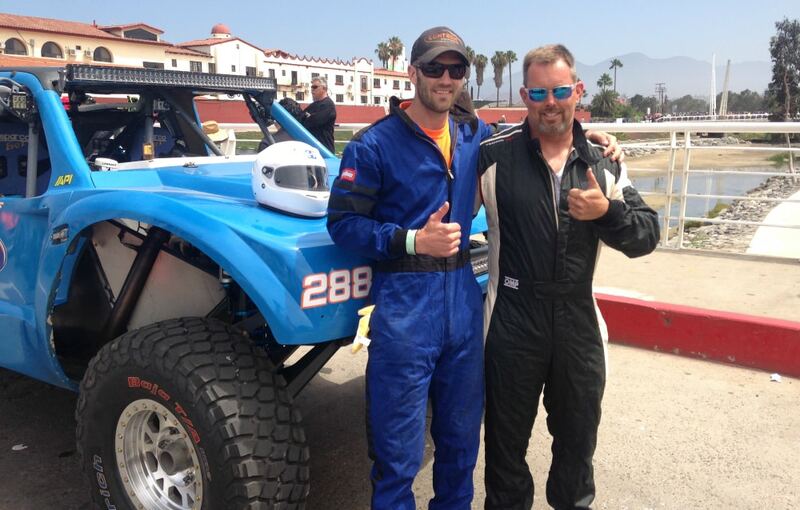 Schlaff has joined Chuck Dempsey, veteran of 32 Baja 1000 races. Together, along with an additional team of drivers and a full support crew, they are racing this year’s 50th anniversary Baja 1000 in Mark’s name. By the time I get off the phone with Greg I’m half choked up myself, and half ready to ask to join his team’s support crew in November. I know what I can do for now though, and so can you. 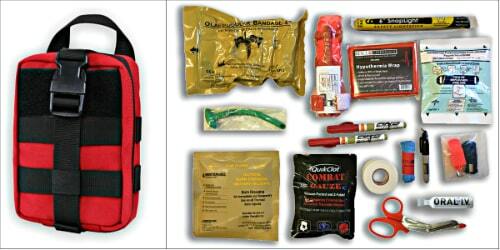 You don’t need to be a desert racer to benefit from Greg’s Race for Safety kits. You can keep one in each of your personal vehicles. It might make the difference for you or a loved one one day. All photos courtesy of Race for Safety.